The initial cooking of the piece of pork is long and slow and can be done a day in advance of your dinner. Then it is just a few minutes on a hot barbecue with a bit of basting. Cut cooled meat into 2.5 cm thick slices. Brush with a little more glaze and sear over hot coals. 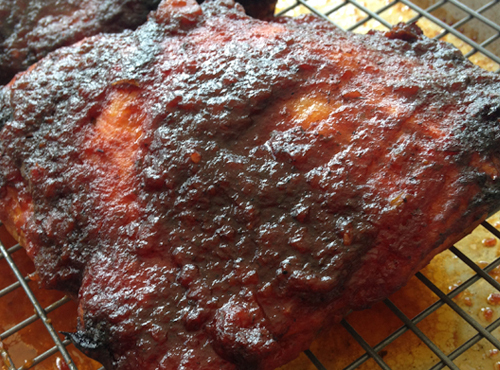 The glaze will become quite dark on the outside but will have flavoured the meat quite wonderfully. Blanch bok choy for 30 seconds in boiling salted water, then drain well. Stir-fry bok choy with a few drops of oil and water until bright green, shiny and still crisp. Transfer to a plate, top with barbecued pork and serve immediately.